We make the process simple and quick! We have extensive experience strengthening the sewer and water pipe structure and repairing broken or leaking underground water lines. If there has been an unexplained increase in your water bill or puddles on your lawn when it has not rained, you may have a leaking water line that needs water line repair or water line replacement. Your home’s main water line can crack for a variety of reasons including the age of your pipes, the material they are made of and the weather and soil conditions. Main water line replacement and installation on residential or commercial NJ property can be a complex process. But it is one that we have done very frequently and we can bring our experience and training to make any water line repair run smoothly and within your budget. Water line repair is key to extending the useful life of your clean water pipeline infrastructure. Reasons for leaking water lines include broken seals around water connectors, tree roots, corroded pipes and more. Our technicians have years of experience finding underground water leaks and perform water line repair before the broken pipe get more damaged and the line is compromised. If you need water line installation in NJ, you can count on our experienced installation team for fast, reliable service and upfront pricing. We offer complete main water line installation for homes, businesses and contractors in New Jersey. We can also install a water line for any type of NJ property, including a new home, office building, industrial complex or retail business. Building a new home or new commercial property in NJ is a big investment. One of the critical features of a new residential or commercial property in NJ is main water pipe installation to provide an adequate supply of clean water for home or business use. New Jersey has many specifications for new water line installation. As contractors experienced in main water line installation in NJ we can help install a new water pipe lines on your NJ property. We have the experience, training and equipment to install water piping and valves and connect your property to the main nj municipal water lines, obtain the necessary permits, and pass all inspections. Many Allendale NJ homes that were built before 1970 may have outdated water systems and corroded water pipes. Over the years older pipes will have internal buildup of minerals and corrosion, causing low water pressure and strange tasting or smelling water. A decayed water line will leak and at risk of collapse without warning, resulting in expensive flood damage and emergency water line repairs. If you want to learn more about our residential and commercial water services call us today at 201-645-0888 to discuss your project. As a long time sewer service contractor in New Jersey we keep up with all aspects of the water & sewer industry, and provide sewer services to municipal, commercial, industrial, residential and agricultural customers. *Camera Inspection* We run a camera through the pipe and find exactly where and what the problem is. *Spot Repairs* We dig a trench only in the area where the pipe is broken, remove the broken pipe and install brand new pipe. Then we fill the hole. *Conventional Excavation* If we need to replace the whole line or a larger area, or if there is a belly and we need to reconfigure the pipes, we may have to excavate all or a portion of the sewer line and replace it manually as with the spot repairs. *Pipe-Lining* We use the existing opening to the sewer to run a new epoxy tub in that will line the interior of the existing broken pipe, essentially creating a new pipe on the interior of your old one; no digging needed! *Pipe-Bursting* This also uses the existing opening to your sewer so usually does not require any digging. A powerful hydraulic machine drags a line through the existing pipe which breaks it and simultaneously installs a new pipe in its place. The first thing we do when we are confronted with a potential sewer repair or replacement is to perform an inspection of the sewer line by camera to see if there is any damage to the sewer line, any cracked pipes, broken pipes, corroded pipes or a sewer belly etc. Our state of the art sewer line camera will find exactly where the problem is which allows us to figure out the most cost effective and time saving course of action. When sewer repair is not the best option and the full sewer line replacement is deemed the most effective solution, we will determine the best way to accomplish the sewer replacement with the least hassle and cost. The most common way to perform sewer line replacement is to manually dig up the sewer line, remove the old pipe and install new ones. This is still an option that is commonly used although it can be a lot of work because the sewer line may run underneath roads, parking lots and private property so when we dig up the line it may not just be a matter of filling up the whole and replacing grass afterwards, we may need to repave the road or parking lot or replace landscaping. free on-site estimate and advice! When you need a sewer install in Allendale NJ let us help you. We are equipped and experienced to handle all types of sewer installation projects. Installing a new sewer line is a big investment of time and resources. You want to make sure it is done right. It’s important to get a highly experienced NJ sewer installation contractor that will have the knowledge to evaluate your property and ensure a smooth sewer installation. Otherwise, cutting corners with a less experienced sewer installation contractor may result in delays, “unforseen” additional expenses, unnecessary property damage, health risks and expensive pipe repairs down the road. Are you a site developer or builder that needs to install new sewer & water lines? We are able to provide reliable sewer line installation services for new homes, buildings, apartment complexes and other construction projects. We have the sewer service experience in New Jersey to ensure dependable quality and affordable prices; on time and within budget! Whether your NJ commercial property is big or small, we offer a comprehensive array of commercial sewer & water services in Allendale New Jersey, and throughout Bergen County. We have experience with the unique challenges in coordinating sewer services for commercial premises in NJ. We can schedule sewer services after business hours to ensure that there is minimal disruption to your business and sewer repairs are completed on time. Emergency commercial sewer service in NJ when you need it 24/7/365. Thorough diagnosis and affordable solutions. Familiarity with complex sewer, water and drainage systems. 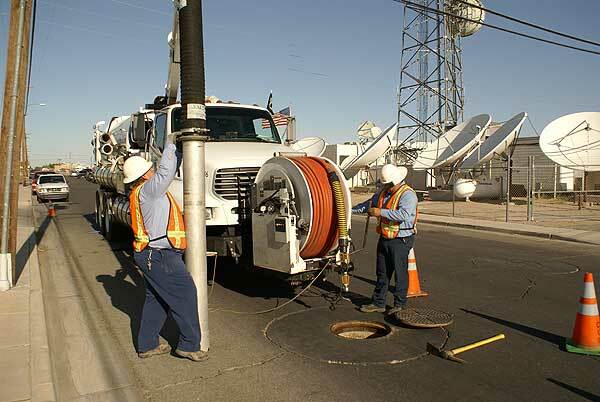 Experience with state-of-the-art sewer service methods, including sewer camera, trenchless and high pressure jetting. We use only high-quality parts and products. Sewer pipe repair or replacement or line replacement by trenchless? When it is possible, we will try to do trenchless sewer line repair methods. This process allows us to repair the pipeline without excavation. We would use the existing openings into the pipe and line the broken pipe with a liner that lines the inside of the pipe like new. Another method is pipe bursting where we push a new pipe inside the existing opening bursting the old pipe into the soil. Your property’s main sewer line is buried underneath the ground, making it difficult to know if your sewer line is leaking and find the exact location of the sewer line leak. Tree roots, weather changes, construction, pipe corrosion and many other things can cause problems with your sewer line. – Frequent Sewer Clogs and Blockages: A sewer line backup can happen in any property due to debris or other buildup, this is normal and can be easily cleared. However, if it backs up again within a few months of the cleaning it may be because you have a broken sewer line. – Sewer Smell: If you smell sewage then you may have a sewer line leak. Sanitary sewer lines should be air tight everywhere so if you smell sewer it is likely there is a break or crack in your sewer line. – Puddles on Your Lawn: Waste water should be running from your home through the sewer lines and into the public sewer, not anywhere else on your property. If you have a broken sewer pipe underneath your yard it may cause pools of water to appear on the surface of your lawn. – Lush Areas of Lawn: Sewage acts as a fertilizer for plants, sewer water leaking from sewer lines into the surrounding soil will give the nearby grass and plants a boost of extra nutrients that will result in unusually green and lush patch of grass in your yard. If you see signs of a sewer pipe leak, don’t wait! Call us immediately for sewer leak detection. The longer you let the sewer leak remain, the more the risk of greater damage. Call right away to schedule an appointment for sewer leak detection service. When you have a problem with your sewer lines at your business property, we understand that getting sewer service and restoring your business to normal operation is the highest priority and time is of the essence. That is why we offer experienced commercial sewer service 24/7, so you can rely on our fast response time and knowledgeable service, whether it is 11 a.m. or 11 p.m.
Sewer problems are especially stressful for commercial properties as business may be shut down or altered as a result of the sewer problem, costing the business time and money. We know this and make sure to respond to commercial sewer service calls promptly, no matter what time of the day or night it may be. When you call us, our sewer service team will arrive quickly with fully equipped trucks to implement an effective sewer solution. Working on underground municipal sewer pipes is a very complex juggling act, and few companies have the sewer & water line experience in NJ that we do. Old pipes may be leaking or broken and repairing or replacing the pipes quickly and on budget is a top priority. Municipal water line repair can be more complicated and labor intensive than residential or even commercial water line repair because they are typically entirely underground, often running below the town’s traffic, public streets, and sometimes private property. Our technicians are experienced in a variety of top-notch technologies and can provide the most advanced solutions available in the industry so your project is completed quickly and on budget. We can offer you a number of distinctly different approaches based on your town’s specific needs and priorities and we will be able to advise you as to the fastest, most affordable and most long lasting solution for your municipal water line replacement project. Municipal sewer excavation and sewer repair on same day. Municipal trenchless sewer repair on same day. Minimal disruption to private property or street closures. We have many years of experience providing septic system installation, septic system repair and septic system replacement for all makes and models of septic systems in New Jersey. We are very familiar with the warning signs for a septic repair and can easily diagnose any problem with your homes septic system. Our experience and knowledge of septic systems can save you time, inconvenience and most importantly money in repair, installation or replacement of your septic system. We offer competitive rates, top quality septic systems, and can get the job done quickly and efficiently. If you require septic tank repair or septic system repair, call us today at 201-645-0888 and let us solve your NJ septic system issues. There are many advantages to the conversion of a NJ property from a septic system to sewer systems that are maintained by the local public works department. Decommissioning your septic system to connect to a municipal sewer system can increase the value of your property, are easier as the sewer system requires almost no maintenance and is generally free from unpleasant odors. If you are considering retiring your septic system and connect to your NJ town’s municipal sewer, call us today for a free estimate. We provide septic installation, septic repair, maintenance, and replacement of septic systems in Allendale NJ, throughout Bergen County and surrounding areas.